Intriguing dark dunes in Proctor Crater. Wind-sculptedMartian landscapes raise questions for scientists about the Red Planet'satmosphere and terrain. Sand dunesare among the "bedforms" or wind-deposited landforms that appear innew images from NASA'sMars Reconnaissance Orbiter (MRO). However, scientists remain unsure as towhether winds on present-day Mars are strong enough to create such geologicalfeatures. "We'reseeing what look like smaller sand bedforms on the tops of larger dunes, and,when we zoom in more, a third set of bedforms topping those," said Nathan Bridges, NASA's Jet Propulsion Laboratoryin Pasadena, Calif. "On Earth, small bedforms can form and change on timescales as short as a day." Other bedformson Mars take the shape of smaller and more linear ripples, in which sand ismixed with coarser particles. New detailsemerged about sediments deposited by winds on the downwind side of rocks. Such"windtails" show which way the most current winds have blown, Bridgessaid. Only roversand landers have seen such features before, as opposed to an orbiter. With the University of Arizona's High Resolution Imaging Science Experiment camera (HiRISE),MRO sees features as small as 20 inches from 155 to 196 miles above the Martiansurface. Researchers can now use HiRISE images to infer wind directions overthe entire planet. Scientistsalso previously discovered miles-long, wind-scoured ridges called "yardangs"with the first Mars orbiter, Mariner 9, in the early 1970s. New HiRISE imagesreveal surface texture and fine-scale features that are giving insight into howyardangs form. 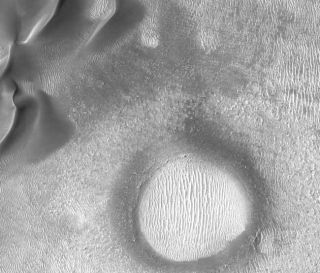 "HiRISEis showing us just how interesting layers in yardangs are," Bridges said. "For example, we see one layer that appears to have rocks in it. You canactually see rocks in the layer, and if you look downslope, you can see rocksthat we think have eroded out from that rocky layer above." New imagesshow that some layers in the yardangs are made of softer materials that havebeen modified by wind, he added. The soft material could be volcanic ashdeposits, or the dried-up remnants of what once were mixtures of ice and dust,or something else. "Thefact that we see layers that appear to be rocky and layers that are obviouslysoft says that the process that formed yardangs is no simple process but acomplicated sequence of processes," Bridges added. Someresearchers have begun comparing HiRISE images with those taken by NASA's MarsExploration Rover, in order to identify previously mysterious features such asdark streaks surrounding VictoriaCrater. Others continue to find surprises while reexamining features onceconsidered common and uninteresting. "HiRISEkeeps showing interesting things about terrains that I expected to beuninteresting," said Alfred McEwen of the University of Arizona Lunar and PlanetaryLaboratory, HiRISE principal investigator. "I was surprised by thediversity of morphology of the thick dust mantles. Instead of a uniform blanketof smooth dust, there are often intricate patterns due to the action of thewind and perhaps light cementation from atmospheric volatiles."